The product you ordered: Smooth printing and fish, amazing price, perfect after-sales service. (reply within 24 hours) Compatible: Epson 252XL ink cartridge. 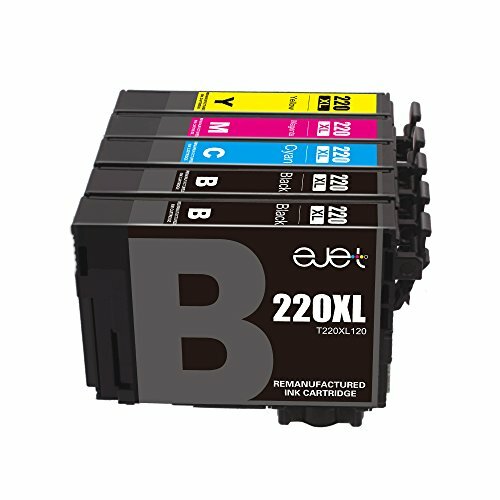 ( 6 Black, 3 Cyan, 3 Magenta, 3 Yellow) Ink Volume:Black 60ML, C/M/Y 18ML Printer compatibility: Epson Workforce WF-3640 Printer Epson Workforce WF-3630 Printer Epson Workforce WF-3620 Printer Epson Workforce WF-7610 Printer Epson Workforce WF-7620 Printer Epson Workforce WF-7110 Printer Epson Workforce WF-7710 Printer Epson Workforce WF-7720 PrinterInstructions for use: 1.This is a compatible replacement product only, this is "NON-OEM". 2.Please confirm your Printer Model before placing order. 3.Please install the cartridge into the correct printer slot. 4.If line or blurry happens, try realigning your printer heads, choose the printer clean option to clean the print head. We suggest cleaning the printer heads everytime you replace the ink cartridge. 5.If your printer do not recognize the ink cartridge at the first time, please take it off and install again. Contact customer service: 1.Please select "FreeSub" below the Price, then click" Ask a question" . 2.Please find your order and click "Contact Seller". 3.Send us email and we will reply you less than "24 hours". 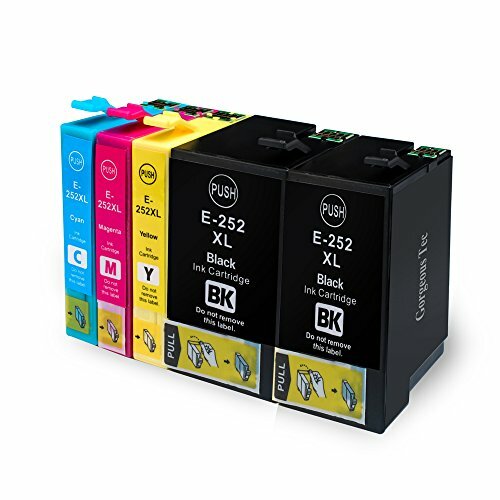 Package Content:5 Pack E-jet Remanufactured for Epson 220XL Ink Cartridges (2 Black /1 Cyan /1 Yellow /1 Magenta) Printer compatibility:Epson Workforce WF-2760 PrinterEpson Workforce WF-2750 PrinterEpson Workforce WF-2630 PrinterEpson Workforce WF-2650 PrinterEpson Workforce WF-2660 PrinterEpson Expression Home XP-320 PrinterEpson Expression Home XP-420 PrinterEpson Expression Home XP-424 PrinterProduct Main Features:Chips:Latest chipset technology allows full compatibility with all printers that take Epson 220XL cartridges.Ink quality:Patented formula guaranteed to provide crisp and clear results for all your printing needs. Professional packaging:Fully stress tested packaging design with multilayer shockproof standards to ensure the security of your cartridges during transit.Note:These are NON-OEM ink cartridges.Please turn the cartridges upside down and remove the protective clip before installing them into your printer.Your printer may display an ink alert message such as "Non-Original Epson cartridges". Simply press "Yes", "Continue". "Accept" or "OK" to dismiss the prompt.Don't hesitate to contact us if any question, we will try our best to serve you and resolve the problem. 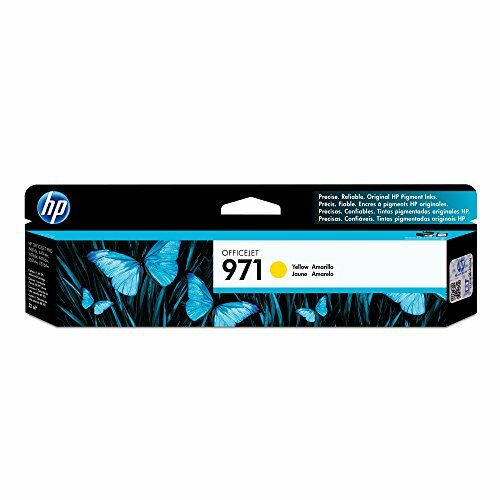 HP 971 Yellow Original Ink Cartridge (CN624AM). 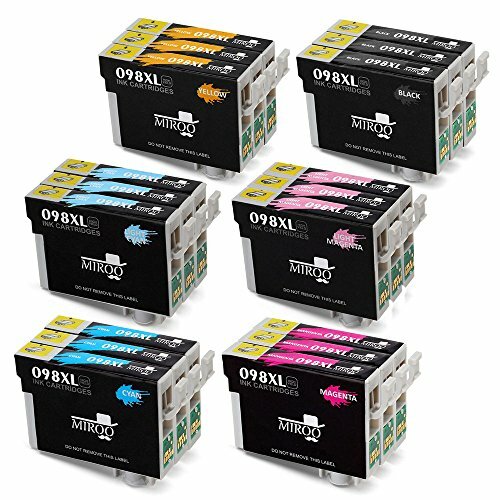 HP 971 ink cartridges work with: HP Officejet Pro X451, X476, X551, X576. Cartridge yield (approx. ): 2,500 pages. Up to 2x more prints with Original HP ink vs refill cartridges. 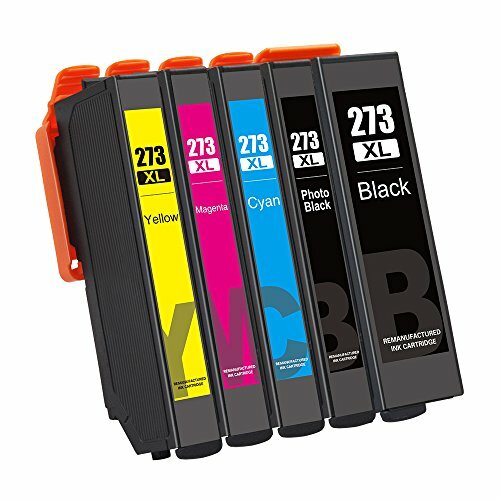 Original HP ink cartridges are specially designed to work with your printer to consistently deliver standout results throughout the life of your cartridge. Ensure that your printing is right the first time and every time with HP printer ink: 971 ink. What's in the box: New Original HP 971 ink cartridge (CN624AM) Color: Yellow. 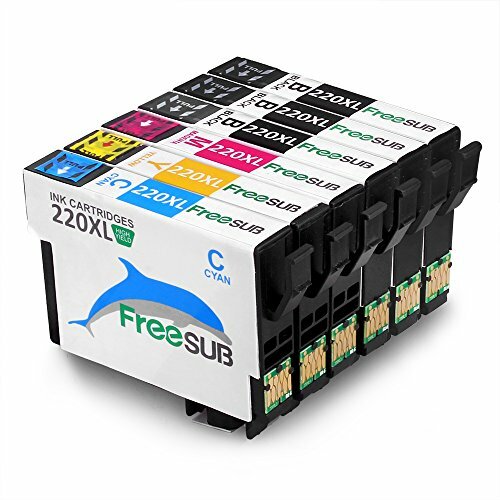 A SAMSUNG color laser print cartridge offers great print quality and reliable performance for an affordable, professional quality color print job. It also has a new advanced toner, ease-of-use features and smart technology. This high-capacity toner decreases cost per print and increases your efficiency. Color: 1 set+2 black(6 pack). 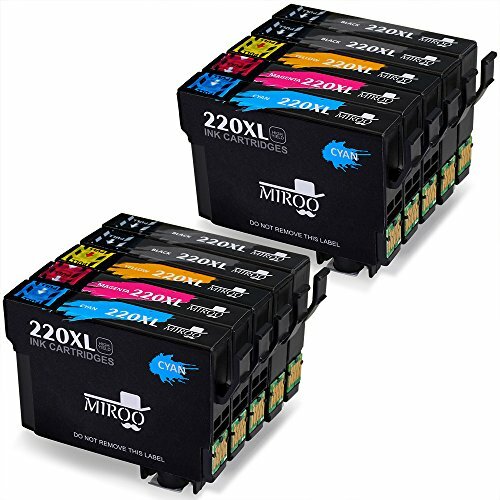 Package Content:5 Pack E-jet Remanufactured Epson 273 Ink Cartridges (1 black, 1 photo black, 1 cyan, 1 magenta, 1 yellow) Printer compatibility:Epson Expression Premium XP-620 PrinterEpson Expression Premium XP-820 PrinterEpson Expression Premium XP-810 PrinterEpson Expression Premium XP-610 PrinterEpson Expression Premium XP-600 PrinterEpson Expression Premium XP-520 PrinterEpson Expression Premium XP-800 PrinterProduct Main Features:Chips:Latest chipset technology allows full compatibility with all printers that take Epson 273 cartridges.Ink quality:Patented formula guaranteed to provide crisp and clear results for all your printing needs. Professional packaging:Fully stress tested packaging design with multilayer shockproof standards to ensure the security of your cartridges during transit.Note:These are NON-OEM ink cartridges.Please turn the cartridges upside down and remove the protective clip before installing them into your printer.Your printer may display an ink alert message such as "Non-Original Epson cartridges". Simply press "Yes", "Continue". "Accept" or "OK" to dismiss the prompt.Don't hesitate to contact us if any question, we will try our best to serve you and resolve the problem. 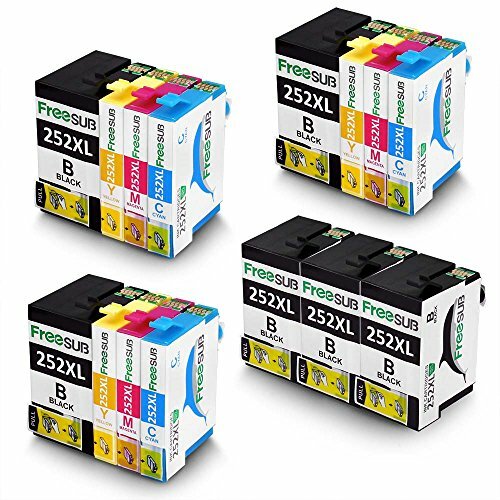 Package Content: 5 Pack Gorgeous Tec Remanufactured for Epson 252XL Ink Cartridges (2 Black /1 Cyan /1 Yellow /1 Magenta) Printer compatibility: Epson WorkForce WF-3620 Printer Epson WorkForce WF-3630 Printer Epson WorkForce WF-3640 Printer Epson WorkForce WF-7110 Printer Epson WorkForce WF-7610 Printer Epson WorkForce WF-7620 Printer Product Main Features: Chips: Latest chipset technology allows full compatibility with all printers that take Epson 252XL cartridges. Ink quality: Guaranteed to provide crisp and clear results for all your printing needs. Professional packaging: Fully stress tested packaging design with multilayer shockproof standards to ensure the security of your cartridges during transit. Note: These are NON-OEM ink cartridges. Please turn the cartridges upside down and remove the protective clip before installing them into your printer. Your printer may display an ink alert message such as "Non-Original Epson cartridges". Simply press "Yes", "Continue". "Accept" or "OK" to dismiss the prompt. Looking for more Capacity Remanufactured Ink similar ideas? Try to explore these searches: Leapfrog Leappad Educational Book, Cctv Audio, and Scion Tc Paint. Do Remanufactured Ink Cartridges Work? Tags: epson work force. wf 2650. ink cartridge.